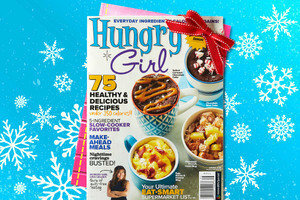 Hungry Girl Magazine: 1st Look + Holiday Offer! Why a magazine? Lisa Lillien (a.k.a. 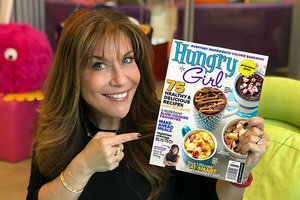 Hungry Girl), started her career as a magazine editor, so it only made sense to expand the Hungry Girl brand into the magazine world. Plus, we wanted the opportunity to deliver exclusive, collectible Hungry Girl content like never before: at-a-glance guides, tear & take shopping lists, bite-sized recipes with full-page photos... THE WORKS! Our debut issue (the Spring edition) premieres in January, just in time to shake up your New Year’s food routine! Get the scoop below, including how to get it delivered right to your door with FREE shipping AND how to order a special 2-issue bundle as a holiday gift! Easy & amazing recipes! 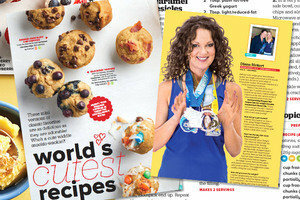 We're talking 50+ brand-new recipes with GORGEOUS photos in each issue. With stories like World's Cutest Recipes, Make-Ahead Mornings, For the Love of Chocolate, and Spiralized Surprise, you'll have LOADS of healthy meals & snack inspiration at your fingertips! Kitchen hacks! Time savers, money savers, food savers, calorie savers... These tips 'n tricks will blow your mind (but not your budget)! Step-by-step how-to's! These visual guides take the guesswork out of guilt-free cooking. First up: spaghetti squash, four ways! The Ultimate Holiday Gift: A 2-Issue Subscription! Your foodie friends and family members will LOVE this... Order our special 2-issue gift bundle, and each issue will be delivered right to their door in 2018! The Spring issue will ship in mid January, and the Summer issue will be sent out in April. Bonus: Shipping is FREE for you, and you'll receive an adorable downloadable gift card to let your pals know they'll be receiving the Hungry Girl magazine. ORDER NOW! Rather snag a single issue for yourself or a friend? No problem! Order the debut issue here, and shipping is free; the issue will ship in January. You'll also be able to find it on newsstands everywhere in 2018! It’s December 13th, National Cocoa Day! 'Tis the season for this Hint-of-Mint Mocha. Share this email with all your pals... just not those you plan on gifting with the Hungry Girl magazine!